Today‘s car manufacturers inevitably have to focus on the reduction of fuel consumption while maintaining high performance standards. In this respect, turbocharged direct injection diesel engines represent an appealing solution. The challenge in developing these engines is – in addition to above-mentioned reduction of fuel consumption and high performance standards – the reduction of raw emissions. Both, fuel consumption and emission formation can be addressed by internal engine measures. In the virtual development of future engine combustion processes 3D-CFD is an important tool. Hereby, the in-cylinder flow, the internal mixture formation and combustion as well as emission formation can be investigated. The diesel engine combustion process is determined, besides flow induced by the intake ports, by fuel injection process and bowl shape. Small changes of the bowl geometry can lead to a significant improvement of mixture formation and thus reduced emission formation. 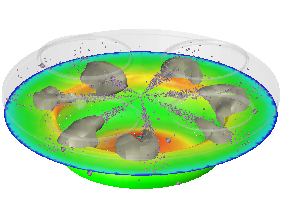 For optimization of the bowl shape CAESES® is used and coupled to the 3D-CFD software to evaluate designs in an automatic loop. Thereby, CAESES® provides parametric models which are transferred to 3D-CFD software via a software connector. For each variant, the compression volume is kept constant by CAESES®. An optimizer analyses the results and creates new parameters as input for CAESES®. The resulting bowl shapes are characterized by improved fuel consumption as well as low raw emissions. With kind permission of Volkswagen AG. There is a blog post about piston bowl design and optimization with CONVERGE. Another article from 2016 shows the geometry modeling and variation procedure for a rather simple piston bowl contour. Finally, for related content check out the geometry variation of a diesel fuel injector. Don’t hesitate to get in touch with us if you are interested in piston bowl optimization. We look forward to discussing e.g. the creation of a variable and robust geometry model for your department.